Our club was started in November 1979 at the Saddlers Sports Centre before moving to City University. The chief Instructor at that time was Phil Newcombe (now 7th dan and the higest Shodokan Aikido grade in Europe) and the club was one of the first in the UK to practice under the tutelage of Irvin Cleydon, a very well respected instructor of the sixties and seventies. During the summer of 1981 Alan Higgs, one of Irvin’s original students, came to the UK after a visit to Japan. He introduced the system of training devised by Kenji Tomiki and practised in the Japan headquesters headed by Tetsurō Nariyama. Our club was the first Shodokan Aikido club in Europe and was aptly named Shodokan London. During the mid-eighties to the late nineties, Phil and his brother Jim spent a good deal of time travelling all over the UK and to Europe spreading Shodokan Aikido. Our club had been responsible for producing many senior instructors who later started their own clubs and many have gone on to represent the UK in international competitions. 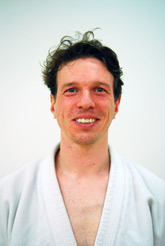 In summer 2003, Phil emigrated to Spain and is now teaching in clubs there as well as heading Shodokan Aikido within Europe. Today, our club has a thriving group of students taught by Steve Trout. The visiting instructor is Jon Cameron, the highest Shodokan Aikido grade and most senior instructor in the UK, who has visited Japan to practise aikido almost every year since 1990 and has been doing aikido for nearly 40 years. Steve has 26 years of aikido training under his belt and became the regular instructor at the City University club 14 years ago. He excelled in the boxing ring, with ten years of competitive experience. He also worked as a doorman and taught personal safety courses to local authority and private healthcare trust employees. Steve emphasises the value and application of aikido techniques in practical situations, as well as guiding students through the Shodokan syllabus. He also travels overseas from time to time to teach at other clubs in Europe. 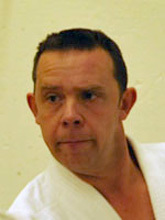 Graham started training Shodokan Aikido in June 2007 with Steve Trout and Jim Newcombe at City of London Shodokan. He has attended many Shodokan seminars around the world and trained under Phil Newcombe, Nariyama Shihan and Tsuchiya Sensei. He has also trained in the Great Britain Squad and competed at national events. Graham has a very relaxed and fun teaching style. You are always in store for a laugh or two when he is on the mat!